Becky Walawender from the Department of Biology here at ODU has been monitoring the soft shell clams that were recruited into our tank this spring. Here she describes the results so far. Soft-shell clams (Mya arenia) have fragile, thin shells made of calcium carbonate and are susceptible to breaking under the acidic conditions associated with excessive carbon dioxide. To test this, we placed 110 soft-shell clams into sediment and monitored their survival in five different pH levels (6.0, 6.5, 7.0, 7.5, 8.0). After two months, we noticed a decrease in survivorship of the clams in pH 6.0. 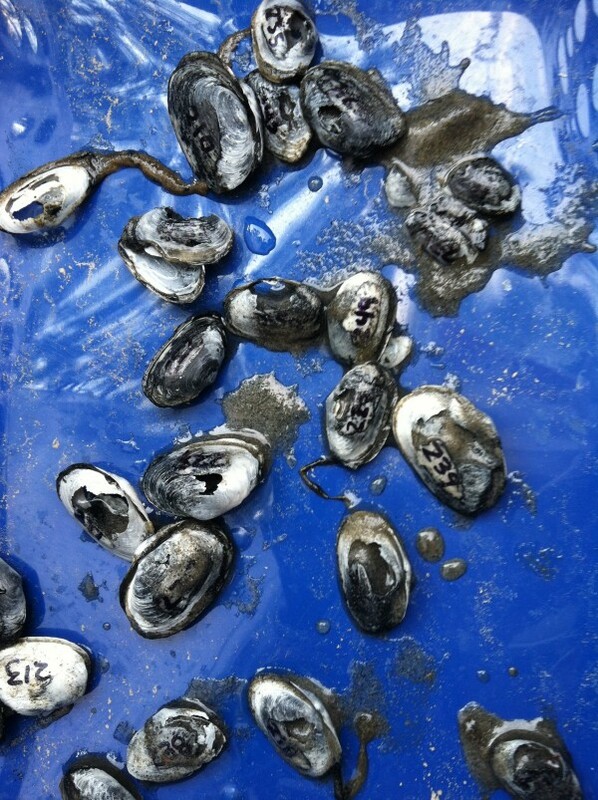 Of the remaining 90 clams in the pH 6 tank (20 were removed for genetic analysis), 55 were confirmed dead, mortality in the other treatments was approximately 6-11 clams. The shells of the dead clams from pH 6.O became brittle and eroded through at the middle, below the umbo.